U.S. President Donald Trump isn’t happy with the Federal Reserve simply keeping rates unchanged last week. 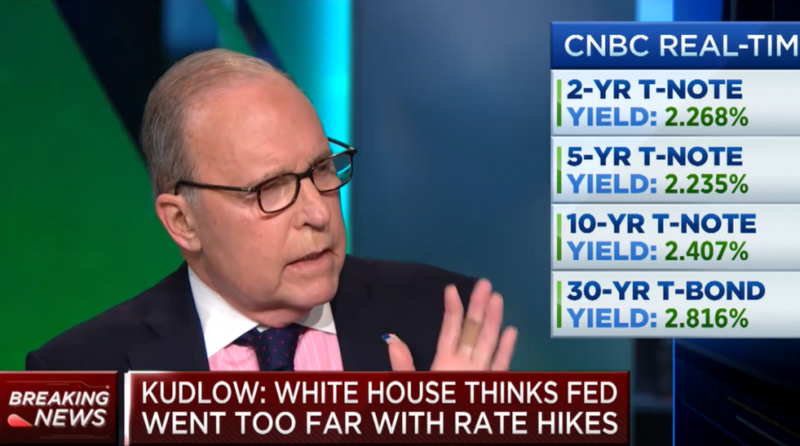 According to White House economic advisor Larry Kudlow, rates should be cut “immediately” by 50 basis points. The decision to keep rates steady last week was widely anticipated by the capital markets as the central bank elected to keep rates unchanged, holding its policy rate in a range between 2.25 percent and 2.5 percent. In addition, the central bank made mention of no more rate hikes for the rest of 2019 after initially forecasting two. However, to President Trump, being in a “good” place is not good enough. “I am echoing the president’s view – he’s not been bashful about that view – he would also like the Fed to cease shrinking its balance sheet. And I concur with that view,” Kudlow said to CNBC on Friday. Kudlow’s comments come as the latest market jitters are now stemming from an inverted yield curve. The short-term 3-month and longer-term 10-year yield curve inversion has been the prime focus the past week–an event that hasn’t been seen since 2007–just ahead of the financial crisis. The spread between the 3-month and 10-year notes fell below 10 basis points for the first time in over a decade. This strong recession indicator contrasted a more upbeat central bank on Wednesday, but investors were quick to sense the cautiousness. As high level negotiations take place during the U.S. and China on a permanent trade deal, the markets are already fretting on a global economic slowdown. U.S. equities are gaining at a strong pace to start 2019, but there are worries circulating that the recent gains are due to markets already pricing in a trade deal. For more market news, visit ETFTrends.com.